NOTE : I have updated some files in this template. Please download again and update with the lates version as the older version may not work correctly. Its been a long time that I designed a blogger template. 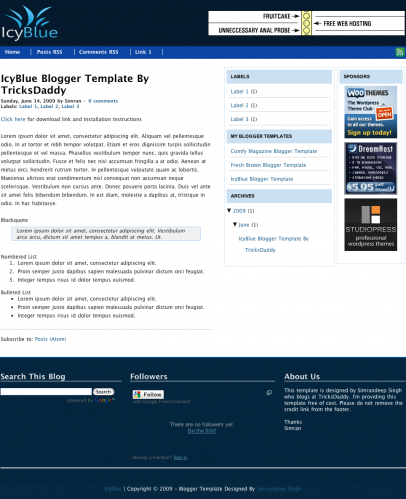 Now I am back again with a new blogger template – IcyBlue. This time I’ve not added any extra plugins to this template. I keep this template neat and simple. While designing this template, I was bit confused about the color combination. Then I came across a site ColorCombo and got this color combination from there. 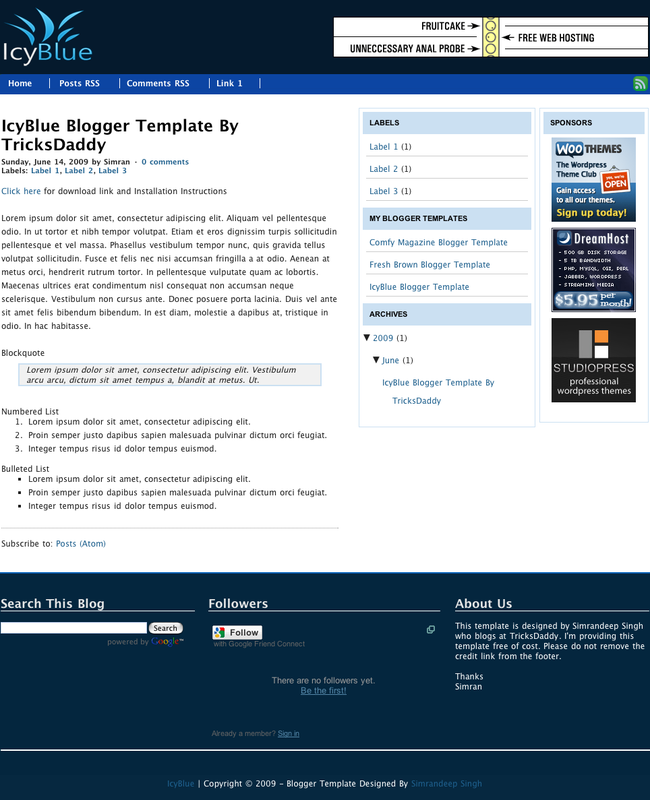 IcyBlue is a 3 column blogger template with neat and clean layout. Its best for technology related blogs but it can be used for any kind of blog. I’ve added 3 columns in the footer also. You can place a lot of widgets in the sidebar and the footer columns. I am giving some customization tips here to help you in customizing this template. and replace it with the URL of your own logo. I’ve not added the search widget. If you want to add a search widget, you can add it from Add a Widget option within Edit HTML page. In order to use recent posts and recents comments widget, I recommend you to use FeedBurner service. You can also use the other scripts available on the internet for recent posts and recent comments widget but they take some time to load and feedburner is faster. Suppose you want to increase the width of right sidebar by 10px, find r_sidebar and increase its width by 10px. But you have to decrease the width of left sidebar according to that means 10px. Similarly you can adjust width of left sidebar. After making changes don’r forget to save the template. For any other queries, you can leave a comment here. Waiting for your respone. Previous Article Get Free WordPress Hosting From Dreamhost For Your Domain ! .-= VISHAL´s last blog ..Install Popular Programs in One Go After Windows Reformat. =-. .-= Bariski´s last blog ..May 2009 Archive =-. .-= Ricky´s last blog ..Unlock PDF Documents Online =-. .-= Wisata SEO Sadau´s last blog ..RUSLI ZAINAL SANG VISIONER =-. .-= Curious Little Person´s last blog ..Has your Blog Lost it? Or Is It Just You! =-. .-= Amal Roy´s last blog ..Get Everest Ultimate Edition Full Version Genuine License key Free! =-. .-= Rajeel´s last blog ..Digital statement blogger template – Updated Version =-. .-= xphunt3r´s last blog ..Europe will get Windows 7 without browser =-. A nice clean theme. Nice of you to give some customization tips in the post as well. I think the colors are nice and easy on the eyes. .-= George Serradinho´s last blog ..Thesis Customizations for Sitemap and Archives Pages =-. .-= TechZoomIn´s last blog ..Scan: Free WP Themes for Malicious Code..! =-. .-= ONLY IN THE PHILIPPINES´s last blog .."ICE BREAKER-PINOY TEXT JOKES IN THE PHILIPPINES" =-. how can i change logo on your template? .-= Erwin´s last blog ..Official candidates for Ginoong Cadiz 2010 bared =-. how can i send the logo for u to place in the header? i have changed the logo but it does not appear. Excellent work done by you simran,v.v.v.thanks to you.Pls suggest me how to remove ads from header. Ya, you can remove. Remove everythig from div class headerright but pls take a backup of your template before removing anything.